The sleek F-105 Thunderchief was envisioned as a supersonic tactical nuclear bomber, but failure of the military planners to develop this mission profile left the aircraft with an uncertain future until U.S. forces were committed to the conflict in Southwest Asia. The ability to haul incredible loads of conventional munitions, coupled with supersonic capability, airborne agility, and the ability to adsorb damage and survive, transformed the F-105 into an aviation legend. 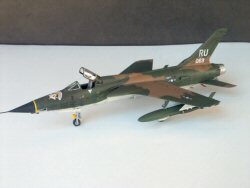 To those who flew and maintained the "Thud" it became the preferred aircraft to penetrate the skies over North Vietnam. 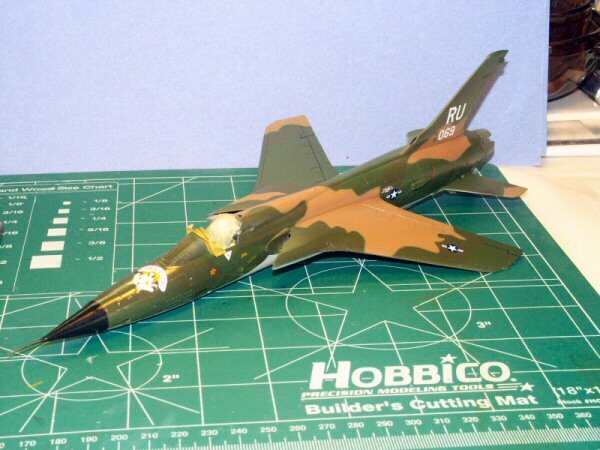 In the mid-sixties, the F-105 distinguished itself as a potent and lethal fighter-bomber. This Thunderchief represents a F-105D-25-RE flown by 357th TFS, 355th TFW "Cherry Girl" Takhli, Thailand. This Thud downed a MIG-17 on June 3, 1967. 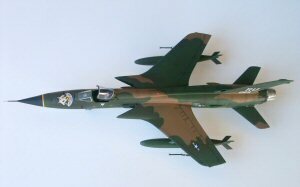 This model of the single-seat F-105D Thunderchief contains more than 80 parts that include a finely detailed cockpit, complete landing gear, external pylons, and a typical load of "iron bombs" as used in combat in Southeast Asia. Recessed detail was found on the flight controls, flaps, leading edge slats and bomb bay. Heavy raised panel line detail throughout as typical for model kits manufactured back in 1988. The main landing gear is very fragile, but sturdy enough to support the airplane, aftermarket metal gear are available from Aeroclub Models AEV171. Aeroclub also makes a nice replacement ejection seat, AEEJ032. Instructions are easy to follow with color references throughout. The kit went together very easily starting with the cockpit, the interior was painted gray with the panels painted flat black and the switches and knobs picket out with a toothpick. The nose gear wheel well was painted flat white and the various hydraulic lines where painted silver, then the nose gear wheel well assembly was glued on to the left half fuselage while dry fitting the right fuselage side, this is so the wheel well mounts straight without any gaps. The cockpit was glued to the left fuselage and plenty of various size fishing weights were glued into the nose area before the fuselage halves where glued together. The Fuselage halves and wing spar lined up perfectly, very little putty was used to fill the seams. The wings were glued together and mounted to the fuselage. Some filler was required to fill the gap on the top of the wing and fuselage. Next the heavy raise detail on the wings and fuselage were sanded down some, the wing beef-up plates where sanded off to represent early Southeast Asia aircraft. The horizontal stabilizers where installed along with the exhaust speed brakes. The model was washed with mild dish soap and water and the cockpit and wheel wells were masked for paint. Model Master Acryl paints where used, Dark Green FS-34079, Medium Green FS-34102, Dark Tan FS-30219, and Camouflage Gray FS-36622. I airbrushed the acryl paints using my Aztec 470 airbrush; panel lines were airbrushed with flat black. I used Yellow Sticky Tack found at Home Depot and masking tape to paint the camouflage. Next everything was coated with Model Master Gloss Coat and allowed to dry overnight. The decals came from Cutting Edge CED48180 F-105 Fancy Girls Part 2 bonus 1/72 decals, and I used the kit decals. Very little Testors decal solvent was required for the Cutting Edge decals. The kit decals required several coats of decal solvent. After the decals had dried overnight, I weathered the plane with a wash of black and gray artists pastel chalk, water and dish soap. Then some of the raised surface detail was dry brushed with pastel chalk, everything was finally sealed with Model Master Flat Coat. I was very pleased with the quality of the cockpit detail and overall fit of the kit, it captures the sleek lines of the veteran fighter. It's not currently available from Revell, but you can find it at local swap meets, eBay and modeling conventions. 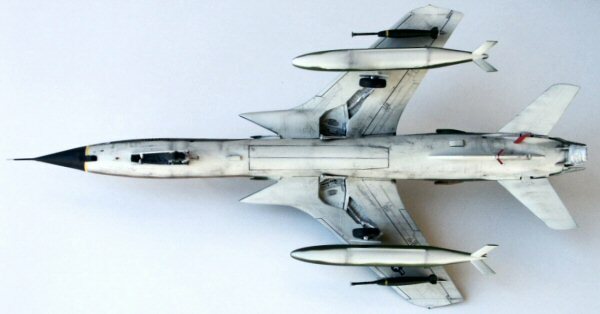 This is a great addition to anyone's 1/72 scale aircraft collection. This kit is highly recommended!